I love falafel…..Strangely enough, I’m not a fan of most restaurant deep fried falafel, but I LOVE homemade, baked falafel. In fact, I’m hoping to be posting my homemade baked falafel recipe later this week. (I just first need to make it and take photos of it:) This recipe is a twist on conventional falafel in that it contains sweet potato. What an amazing idea! 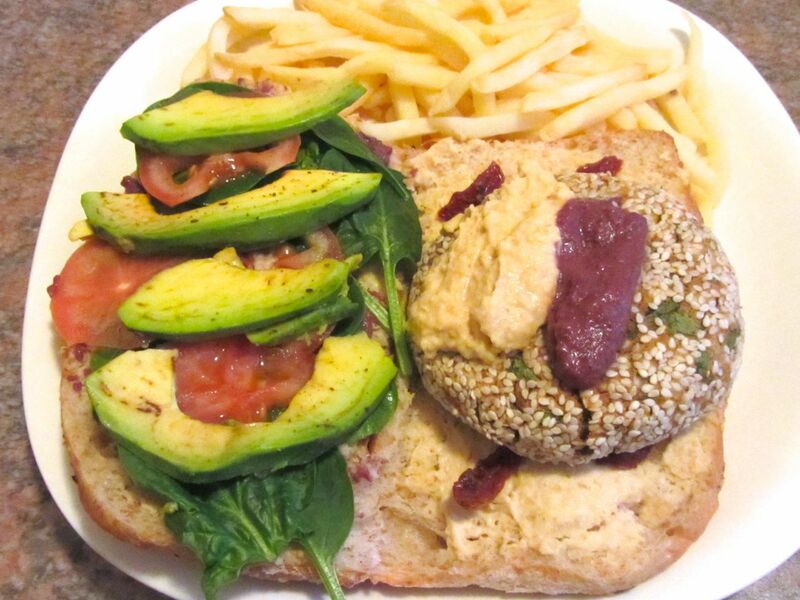 The flavours of the sweet creamy sweet potato and chickpeas just fuse together to create an amazing vegan patty. Also, a food processor is not required for this recipe so if you don’t have one – no excuses! This is such a simple, yet delicious, way to prepare your daily veggies. It can be done on a braai/barbeque or in the oven. Herbs and seasonings can be adjusted to personal preference. Any veggies you can find! I like using: butternut, sweet potato, brinjal/eggplant, baby marrows/courgettes, patty pans, garlic cloves (whole with skin removed), baby tomatoes, pickling onions or normal onions cut into quarters, different peppers, carrots, baby potatoes etc. Chop vegetables into small chunks. The smaller your chunks, the quicker it cooks. 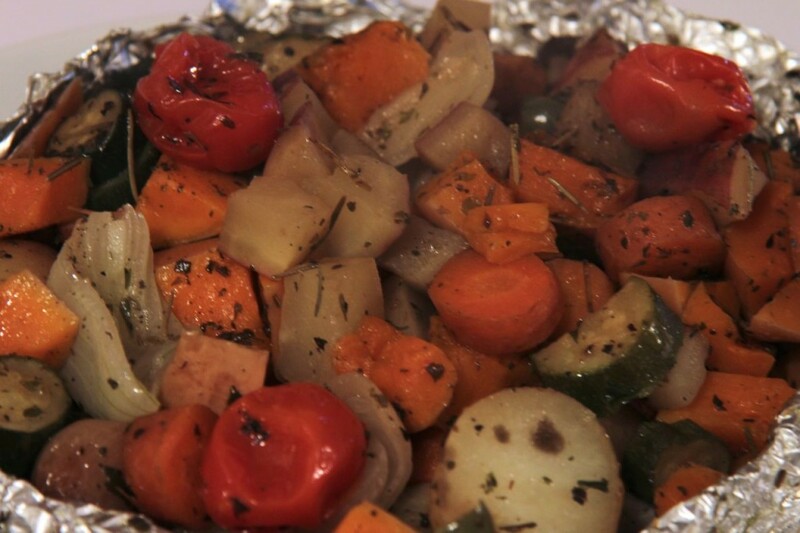 Divide vegetables into individual serving portions and place in foil. (Each person gets their very own veggie parcel – yay!) I like to spray with olive oil spray as you use less oil this way, but you can also drizzle olive oil over the vegetables. Season generously with herbs and salt to taste. (I go crazy with the herbs, using about 1 flat teaspoon of each herb. Play around and see how “herby” you like it.) Give it a good grinding of black pepper and wrap parcel up tightly. Use more foil if needed to get a good seal. Bake in a preheated oven at 180°C for 1-1,5 hours (depending on your oven strength, the size of your veggie chunks and the size of your parcels.) After 45 minutes, carefully open up the foil and give a carrot a poke. If tender, it is cooked through, if not, cook longer. Alternatively, the parcels can also be placed on the barbeque/braai until vegetables have cooked soft. Serve with salt flakes on the side. This recipe is easy and very tasty. It can be served as a side dish, but personally, I prefer to serve it as the main dish with other dishes on the side. I served this with a delicious herbed veggie parcel. Stir millet in a dry non-stick pan over medium heat until nicely roasted and golden. Set aside. Scoop out eggplant flesh, leaving a rim of about 1.5 cm of flesh intact in the shell. Chop eggplant flesh. Add chopped eggplant, garlic, red and green peppers to the non-stick pan and cook (stirring frequently) until eggplant is almost cooked. You will need to add tiny splashes of water every now and then to prevent it from catching. Stir in toasted millet, tomato, chicken broth, spices and salts. Bring to a boil over high heat. Reduce heat to low and simmer for about 15-20 minutes or until the excess liquid has been absorbed. Remove from heat and allow to cool for 10 minutes before scooping into the prepared eggplant shells. You can leave as is or top with chopped peppers, vegan cheese or nutritional yeast. Place the two eggplant halves into a small dish into which they fit snugly. (You don’t want them falling over in the baking process.) Carefully pour boiling water into the dish so that it makes a water level of about 3cm. (To avoid wetting the eggplants, you may want to do this before placing the eggplants into the dish.) 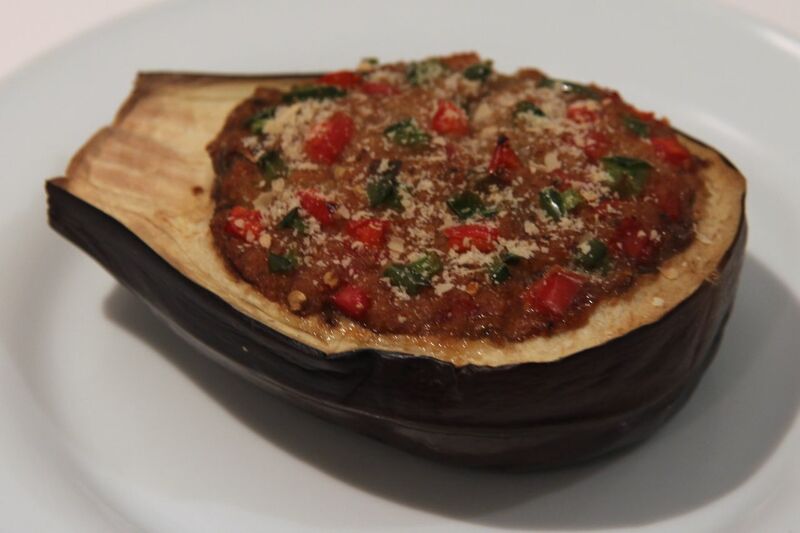 Bake in a preheated oven at 180ºC for 20 minutes or as long as is needed for the eggplant shells to cook through. I am Dr T and this is about my journey to a healthier lifestyle through a vegan, gluten-free and mostly sugar-free way of eating. Join me on the ride - I promise we'll have fun!